Are You Tricking or Treating Yourself? That delightful time of year when kids dress up like witches, vampires and Princess Elsa to knock on the doors of their neighbours and ask for candy. “Trick or treat!” is the customary greeting, with the convention being that if they don’t get a treat, you’ll receive a trick. Something good, or something bad? 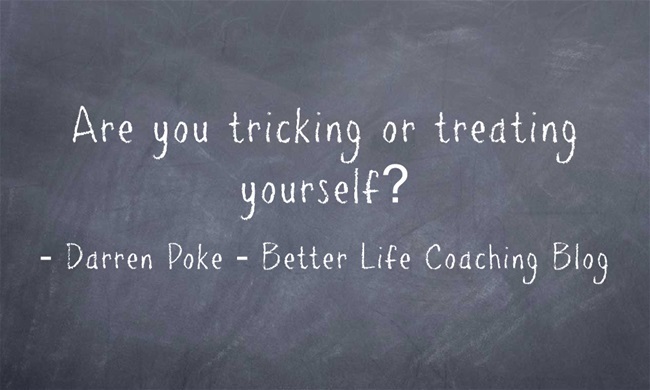 Which leads me to my question for today, are you tricking or treating yourself? Are you tricking yourself into believing that one day you will win the lottery and everything will magically work out OK, or are you treating yourself to an exciting future through discipline and hard work? Have you tricked yourself into believing that we live in terrible times, or do you treat yourself by acting in the knowledge that the best is yet to come? Do you see yourself as cursed, with scary monsters around every corner holding you back, or do you count your blessings and know that God is on your side? Are you working in a dead-end job with people you barely like, or are you engaged in meaningful work that maximises your capabilities? Are you focused on short-term gains that don’t lead anywhere, or are you working towards long-term goals that will set you up for a successful future? Is your peer group holding you back through their negativity and cynicism, or are you hanging out with people who inspire and motivate you to make the most of every day? And are you waiting for people to treat you badly so that you can respond with anger and trick them back, or are you looking for ways to be a blessing to others regardless of whether or not they give you treats?